Rescued kitten thinks dog is mama, gives her kitty bath, then they spoon and sleep! 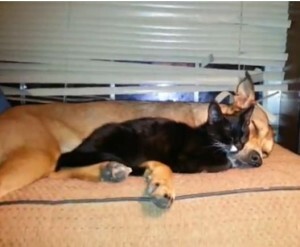 A cat rescued at 10 days old found comfort with her family’s two dogs and remains closely bonded and affectionate with them. Here she bathes one of the dogs, then cuddles up close. The kitten, was about 10 days old (eyes barely open), when we found her next to an open field, in a thunderstorm, about to crawl across a busy road we were driving on to get home from my parents’, named Tanner Rd. So we appropriately named her Tanner. I just caught her out of the corner of my eye, and actually passed her up and had to turn around. She was cold, muddy, & soaking wet.We looked for her mama, who must have been a stray moving her litter out of the rain, but after a few minutes we decided she had a better chance with us. She was obviously frightened, freezing, in shock, and hungry, so as you can imagine it was nothing but cry, cry, cry, eat, cry, cry, cry, sleep, cry, cry, cry. UNTIL, one day Farrah & Scully, our two dogs, started laying next to her. Tanner would crawl into their tummy, tail, neck, anywhere she could cuddle up and she would feel comforted. Since then, they are all inseparable, and moments like this happen quite often. She’s a ball of dynamite, hyper most of the time, but she is a lap cat, and the dogs make as good a place to sleep as our laps. Some of the cleanest ears around. Very sweet. So sweet. The blinds looks like the blind in my bred room. LOL!! This article is not just interesting, but also informative and We appreciate that please keep going to write more content.